We often find vintage or antique chairs on our buying trips that are perfectly gorgeous, but the upholstered seat is showing its age! The seat caning needs to be fixed or the upholstery needs to be replaced. If the chair frame is beautiful quality and in good shape, then we go ahead and buy the chair anyway. We know someone will love to get their hands on it as we often work with customers and interior designers who just know their own taste. They look past the old upholstery or broken caning, and can see that an upholstery makeover will give the antique chair frames a whole new life. Here’s a case in point! 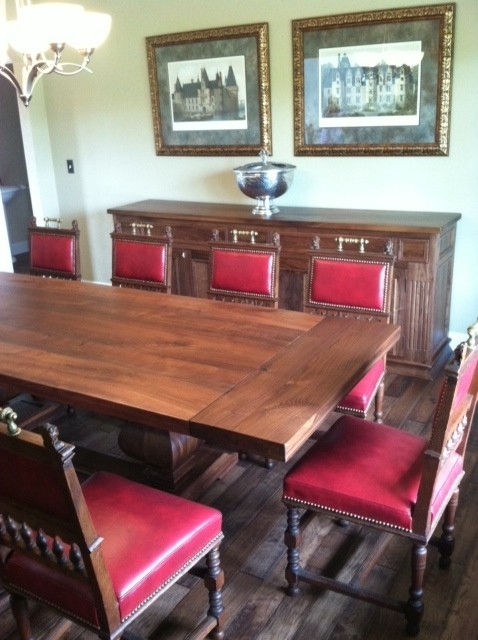 Our client Susan D. in Metamora, IL purchased a set of twelve Renaissance style chairs from us. 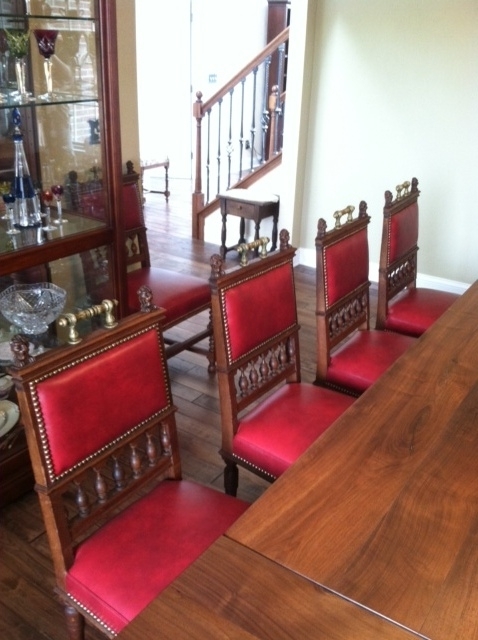 The Belgian chairs date to 1900 and feature regal lion carvings and metal handles. 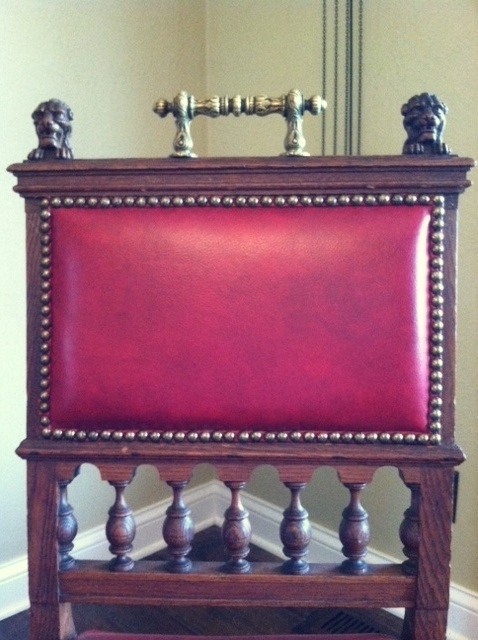 The sturdy oak frames were in superb condition, but seven of the twelve chairs needed to be reupholstered. As you can see from the photos, they turned out wonderfully! 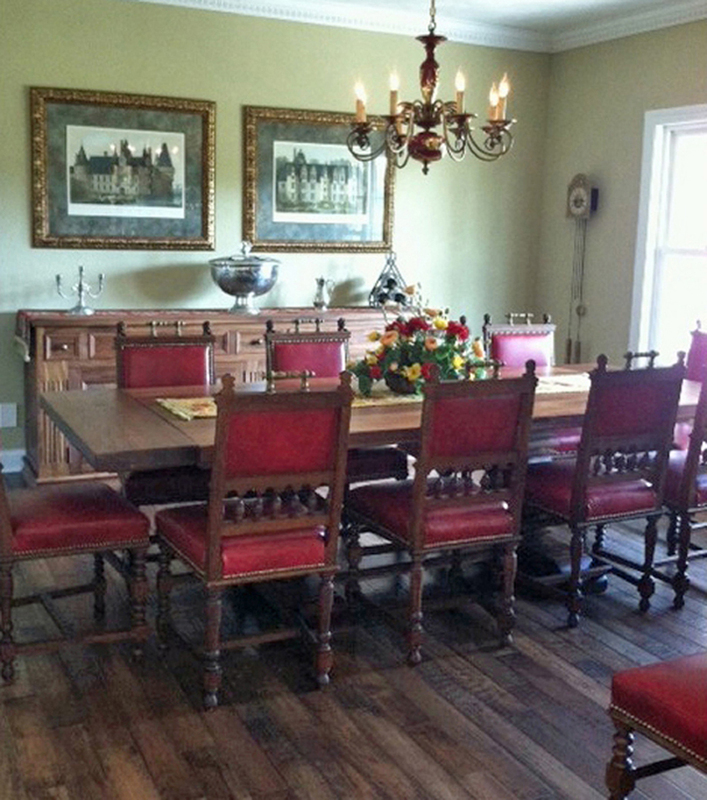 Susan did a terrific job in having these dining chairs reupholstered to suit her taste. The rich red looks gloriously opulent against the dark oak wood. 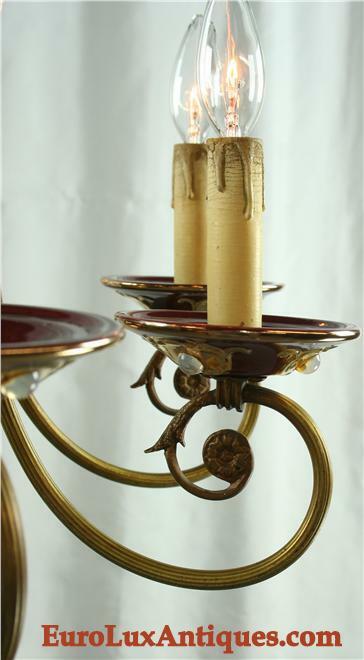 Susan just purchased this lovely vintage chandelier to hang over the dining table and match the red in the chairs. 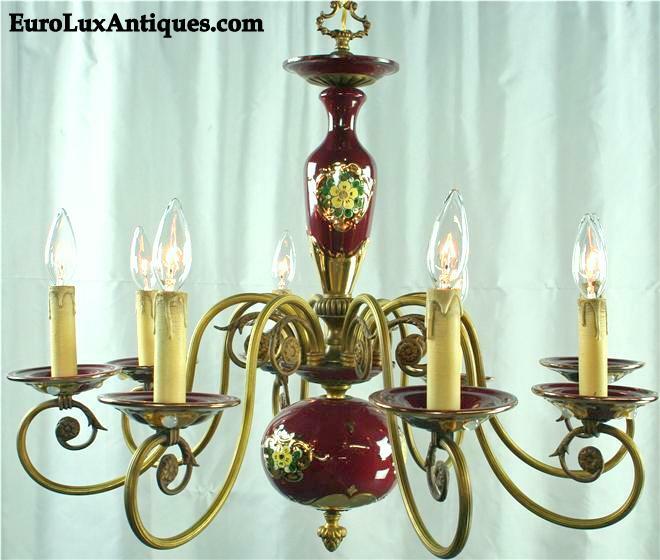 The Belgian chandelier by Hubert Bequet dates to 1950 and I think we can all see that the deep burgundy red of the ceramic body will look fabulous in Susan’s dining room! Although most of the antique chairs at EuroLuxAntiques.com are in good shape on the upholstery and caning, we almost always have a few that would welcome some TLC. It’s just a fact of life that upholstery wears out when you’re dealing with very old, original antique chairs. But they offer great value for money and give you the chance to add your own style stamp. You can upholster all the chairs the same way, or get creative and design smaller sets: Two sets of six or three sets of four. If you don’t want to find a specialist to reupholster your chairs, this HGTV DIY tutorial shows How to Re-Cover a Dining Room Chair and Better Homes and Gardens has a Chair Upholstery Step-By-Step Guide. 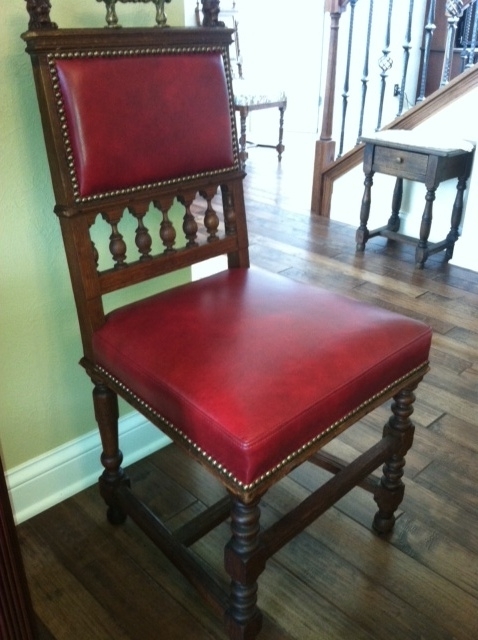 This entry was posted in Antique Furniture, Client Spotlight and tagged antique chairs, dining chairs, red, red dining room, renovation, upholstery, using red in rooms on July 19, 2013 by admin. A room decorated in neutral colors is always so relaxing. Earthy natural tones tend to be warm and welcoming, while gray or white often create a sophisticated atmosphere. 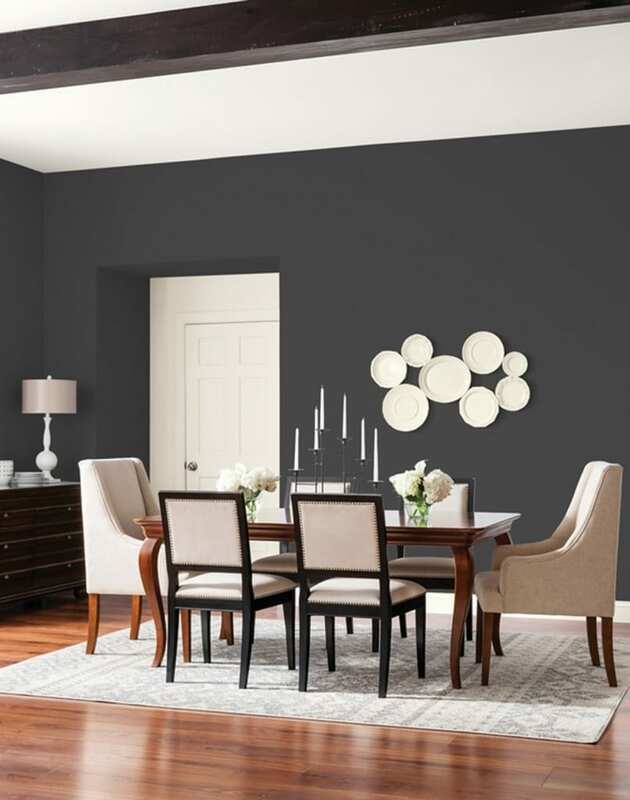 But a pop of color from antique or vintage furnishings or accessories can enhance the neutral decor even more. The color accent also provides a focal point for the space. Check out these vintage color accents for inspiration! Our customer Anuradha V. created a very moody vignette with a 1920s green enamel pitcher from EuroLuxAntiques.com in her home in India. The antique enamelware lends an authentic and subtle dash of color to this beautifully simple and restful space. The entire image almost looks like a painting from a Dutch master, doesn’t it? I can imagine seeing this in a museum! On a grander scale, the colors in this reception room in the Wimpole Estate mansion in England are actually quite plain, once you look past the stately home’s imposing size and columns! The main decor is white and the floor is natural wood. 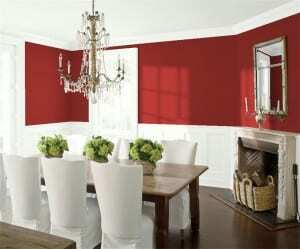 But the rich splash of red gives it an opulent feel. The glow of the swagged red drapes draw you into the room and the red upholstered antique chairs invite you to pause a while. Queen Victoria certainly paused a while. She stayed at Wimpole Hall for two nights back in 1843. This room in Frank Lloyd Wright’s Rosenbaum House in Florence, Alabama, also relies on furnishings for color accents. The fabulous spark of blue in the vintage chairs just leaps out from the rustic brick wall and wood paneling. I’d call that a Capri blue… What do you think? 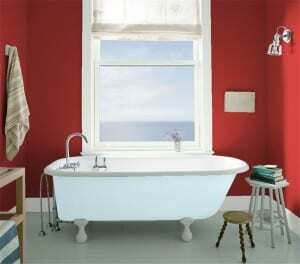 It’s easy to inject color into a room with a collection of colorful vintage or antique pottery. I like the freshness of the blue and white ceramics in this elegant white setting. The display of bowls and vases at different levels also creates visual interest. I always enjoy selecting classic blue and white Delft antique pottery for EuroLuxAntiques.com because it’s so pretty to look at, and it brings a timeless note of color into both contemporary and traditional decor. Our customer Julie F. in Marquette, Michigan showed off her 1890 blue Delft garniture clock in fine style! 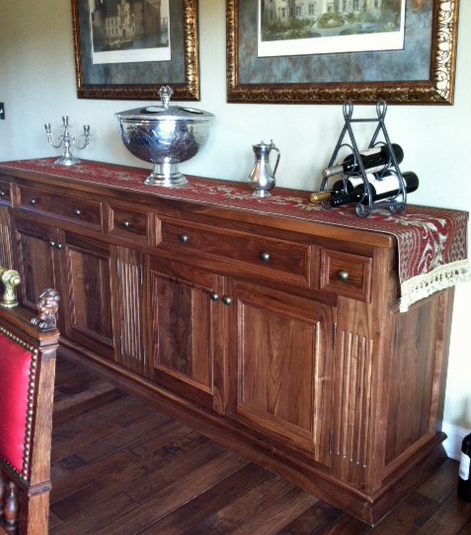 She displayed it against a stone fireplace, as you can see in our earlier client spotlight. The delicate blue looks superb against the neutral backdrop of stone and wood. 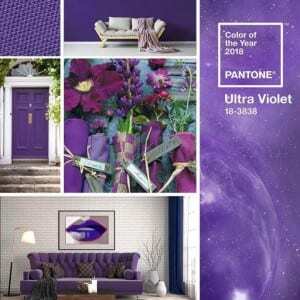 If you’ve used vintage or antique furnishings and accessories to add a pop of color in a neutrally decorated room, we’d love to feature it on this blog. Send us photos of your vintage color accents! This entry was posted in Antique Furniture, Home Design Ideas and tagged accessories, Antique Blue Delft, Antique Clocks, Antique Furniture, antiques, bold colors, color, EuroLux Antiques, home decor accessories, interior decor, living with antiques, neutral colors, red interior design, using red in rooms, vintage color accents on April 16, 2013 by admin.